This year marks the 101st riding of the Tour de France, one of the most brutal sporting events ever created by man. In fact, plenty of us are so focused on the madness that we overlook how incredible the technology that powers it has become—and how it's evolved over more than a century. We ran across a great collection of bikes used on the tour last year, courtesy of Emile Arbes at Le Blog de Velos Vintage, and added extras from around the internet, below. In honor of this year's tour, we've updated it and added a 2014 bike. The collection begins at the very beginning, when road-ready meant extra mustache wax, and extends to the modern day, when bikes are so light riders often have to weight them to stay legal. Keep in mind, we haven't spent much time focusing on contemporary technology—that's another post for another time. Sixty cyclists set out to compete in the first Tour, and only 21 finished. Maurice Garin, aka the Little Chimney-Sweep, won the day on this steel La Française. His heavy frame featured new-fangled toe clips—invented only a few years prior. A more modern geometry was emerging a decade later—check out the more recognizable drop handlebars on this Thomann-Joly ridden by Belgian star Léon Scieur, who won the tour in 1914 riding what was likely a very similar bike. Also check out the pump on the seat tube—back then, riders still did their own maintenance. In fact, it was against the Tour rules to receive help. The Tour's first Italian winner, Ottavio Bottecchia, rode a flashy AuTomoTo-Hutchinson to victory in 1924. Three years later, he was found dead of a skull fracture on the side of the road with his bike untouched. His death still remains a mystery, but some attribute it to Mussolini thugs, wary of Bottecchia's anti-fascist leanings. André Leducq, who won the Tour in '30 and '32, rode a sea foam-colored Alcyon-Dunlop. The derailleur was introduced to the Tour seven years later, in 1937, but before that, riders would have to get off their bikes to switch gears. Antonin Magne—aka "the Monk"—won the Tour in '31 and '34, when he secretly tested the first Mavic "Duralumin" rim during the race. He even went so far as to paint wood grain on the rims to avoid detection—such tech was against the rules at the time. 1947 Tour winner Jean Robic, who was known as "the hobgoblin of the Brittany moor" (great nickname!) rode this 1952 Colomb-Clément. Robic was one of the first riders to wear a helmet after fracturing his skull, in 1944. Jacques Anquetil (seen above with Eddy Merckx) won the Tour five times riding a Saint-Raphaël-Helyett 1962. Felice Gimondi—who won the Tour in '65—rode a Celeste-green 1967 Bianchi for several years. Contemporary Bianchi fans will recognize his initials—they're used for the company's FG Light frames. 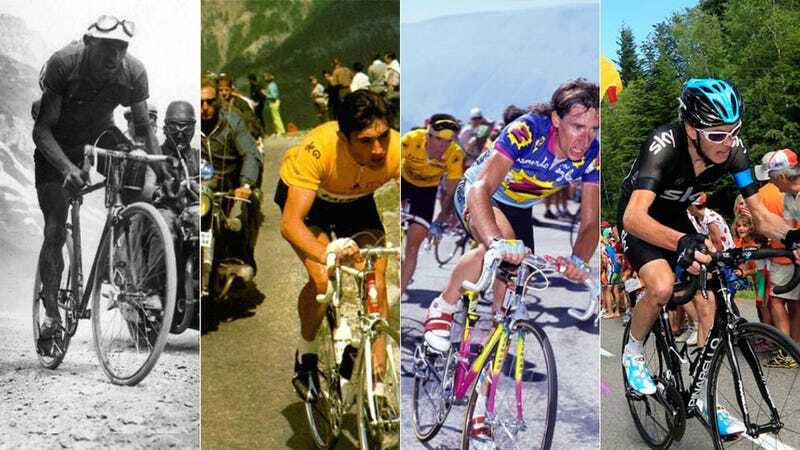 Eddy Merckx is probably the best-known ride of the 20th century—he won the Tour five times, and went on to become what some claim is the most accomplished cyclist of all time. There's plenty to say about Merckx, but it's far more exciting to watch him in this excerpt from A Sunday In Hell, a documentary that covers the famously brutal Paris-Roubaix. The very last time a steel frame bike won the Tour was in 1994, when Miguel Indurain clinched his fourth of five wins. His 19.8lb Pinarello, according to some sources, was only branded as Pinarello—in reality, it was custom-built by Dario Pegoretti, the iconic Italian frame builder. Now we're getting into the contemporary era, with companies experimenting with non-steel and, eventually, carbon fiber. Marco Pantani's Bianchi Mega Pro XL Reparto Corse, a custom-built aluminum frame, was the last bike to be ridden to Tour victory that wasn't made of carbon fiber. It was the end of an era. Sure, Lance Armstrong has since been stripped of his titles, but his steel 1994 Motorola-Eddy Merckx (above) is fascinating to compare to his later rides. Armstrong went on to become an early adopter of contemporary cycling tech, mostly in partnership with Trek. He was the first Tour winner to ride a carbon fiber bike from start to finish, and in 2003, he rode the lightest bike ever used in the Tour. Though the biggest bike news in this year's tour so far might be about a broken frame, there are some cool bikes being ridden. Take Trek's Emonda, the lightest frame the company's ever built (that's it in a non-tour promo shot). In fact, it's too light for regulation—Trek tweeted this photo of a lead bar that had to be added to "make weight:"
This post originally appeared on Gizmodo in 2013, and has been updated for this year's tour. There are plenty that we haven't included—so drop your contributions below. All images from 1903-1976 courtesy of Emile Arbes at Le Blog de Velos Vintage.